These days the kitchen is the very heart of the home, a place to express yourself, not only in what you create in the kitchen, but in how you create the kitchen itself. At the very centre of any kitchen is its sink and tap. 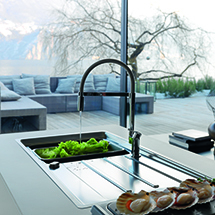 No other items better encapsulate the kitchen’s balance of form and function, and Franke is uniquely placed to support your lifestyle choices through a diverse range of styles to suit any personality. Be inspired by the Franke range as it constantly evolves to bring kitchen dreams to life.